Play one part yourself, let your student play the other. Play a piece first using the version with accidentals written into the score. Then cover up that version and let them try the version with the key signature. What becomes harder? Is anything easier? Play one part yourself and see if your student can play it back to you without looking at the music! Have the student play one part and see if YOU can play it back without looking at the music! Play the phrases in a different order. Try playing every other phrase. How does that change the way the piece sounds? Do some phrases sound like endings? What do the other phrases sound like? Why wouldn't you want to end with some of them? I hope you and your students have as much fun with these pieces as I have had with my students. A few weeks ago we watched Natalie as she used my Sight Reading Flashcards for the first time. Now we have a chance to watch her twin brother Thomas give it a try. It's interesting to see how differently they approach the same task. Natalie is more serious, Thomas jokes and pranks his way through. Both of them learn all the concepts they need to, and both have a good time. Having the right materials can make all the difference in your ability to teach sight reading, and your students' success. Get your copy of Sight Reading Flashcards (with a studio license) here. Burgmuller Arabesque: Those pesky eighth note rests weren't typos after all. "Those little squiggles? I assumed they were just typos." My new student, Harold, was playing the Burgmuller Arabesque. I'd asked him if he knew what the eighth notes rests were. How had this happened? Harold, age 67, was a new transfer student. He'd been studying for years, but his teachers had let him down. He couldn't read music. He didn't even know what the most basic symbols meant. In my years of teaching, I've met many Harolds. Each one arrived at my door with their particular mix of limited knowledge and illiteracy. It's turned me into a champion and teacher of sight reading. I, myself, was a child who didn't learn to read music until well into middle school. My combination of perfect pitch and a first teacher who didn't notice I hadn't learned to read had left me musically illiterate. It wasn't until playing flute in my middle school band and accompanying the chorus forced to learn to read that I finally did. By that time I was already playing the Mendelssohn G Minor Concerto. Not able to read it, but playing it nonetheless. I think we owe it to our students to teach them to read well. It is a matter of making it a priority and assembling the right materials. Here are ten tips to make you a better sight reading teacher. 1. Every musician plays better than they can sight read. This may seem obvious, but it isn't. I can play Rachmaninoff Concertos, but I can't sight read them easily or fluently. There's a relationship between the music I can sight read and the music I can play. I am an excellent sight reader, but even I can't play at sight the music I can play after hours of thoughtful practice. 2. Students do best when their sight reading stays only a few levels below their performance ability. Brent, another transfer student, came to me at age twelve, able to play Joplin Rags and Beethoven Sonatinas. As I got to know him better, I realized that he couldn't read a note. I mean, he literally couldn't read music. Didn't know the difference between an eighth note and a quarter note. He vaguely knew whether notes went up or down, but couldn't tell a second from a third. His previous teacher simply hadn't realized that every time she demonstrated something for him he was swallowing it up and regurgitating it note-for-note. When we started working on sight reading, we went back to nearly a Primer level to find something he could play fluently at sight. It wasn't fun, because his playing ability had gotten completely out of the range of his ability to read. There was no relation between what he could read and what he could play. 3. The bigger the discrepancy between reading and performance level, the more the student will try to hide it. Students who perform their practiced repertoire well may often not realize that their sight reading level is not expected to be at the same level. If the only music they are given to read is music that takes weeks or even months to learn, why would they think otherwise? It's embarrassing to admit that one doesn't know how to sight read a piece. Teachers need to take the time to explain and discuss the perfectly normal gap between reading and performance ability. 4. Sight reading music that's too difficult isn't really sight reading. Playing at sight means exactly that — playing it at sight. Not fussing around and making mistakes and apologizing and making the same mistake and apologizing again. Sight reading should be done with music that one can play when one looks at it. 5. Sight reading should be enjoyable. Reading music for pleasure should be the same as reading books for pleasure. You should know the vocabulary, the basic sentence structure, and be able to figure the rest out by context. It shouldn't feel like reading this dissertation on C.P.E. Bach. C.P.E. shoved aside the decorous roccoco style of the era to embrace "Sturm and Drang" – "storm and stress" – as well as Empfindsamkeit, or "intimate expressiveness." The dark, dramatic, improvisation-like passages that turn up in pieces by Haydn and Mozart bore the direct influence of C.P.E. 6. Too easy is better than too hard. Reading a book that you can understand is more fun than reading one that leaves you puzzled. It's the same with music. Finding the sweet spot of what one can do easily and mixing it with teeny, tiny challenges can require some thought and preparation. It's also why materials made specifically for sight reading can be so helpful. 7. Do it with them. It's not cheating to look through the score first. In fact, I recommend it. Preparation is especially easy if the "piece" is a flashcard that's only four measures long. Looking for patterns, direction changes and hand changes makes it more likely the first time through will be correct. This will vary depending on the student. Some students might need to highlight each note in the simplest flashcard. Others may need no preparation at all and be able to dive right in. It will also depend on how challenging the material is for the student. Circling the thirds is an excellent way to help students learn to spot them. Use highlighter tape, highlighters or washi tape to mark changes. This could mean highlighting the LH notes blue and the RH notes red. Or, highlighting all the C Major chords purple, the possibilities are endless. 10. Sight Reading is forever. Sight reading isn't a single skill to acquire. It's more like the cardio in your workout routine. You need to keep doing it so that you don't lose your ability to do it. It's one of the most important, if not THE most important skill you can teach. If we want to create independent learners, then we have to teach them the skills of independence. The ability to read fluently has to start at the beginning. What strategies do you recommend for developing reading skills in beginners who seem to memorize their pieces almost instantaneously? I understand her question. If a student memorizes something almost instantaneously, how do you teach them to read? At the beginning, for some gifted students, they can play at almost the exact same level they can read. This doesn't usually last long, but I have had it last for as long as six months. My student, Leo, was like this. My strategy was simple. I kept him reading. We "assigned" pieces even though they were memorized by the time he left, and we kept assigning them week-after-week until there was finally something to practice. In the process, Leo became one of the best readers I've ever taught. The fact that he could memorize his music did not in any way prevent him from becoming an excellent sight reader. Here are some materials I've put together that may help you in your goal of creating a studio full of excellent sight readers. Let me know how it goes! You'll wonder how you ever taught without this 32-page book. I made these cards for my students to give them plenty of opportunities to practice all the different skills they were acquiring. This series starts with the simplest possible rhythmic patterns on the Landmark notes Middle C, Bass F and Treble G. Each set becomes incrementally more difficult. Circle the thirds before starting to read the flashcards. This helps the student focus on the difference between steps and skips. Help your student write in their own staccatos and slurs. Try them out. Talk to them about why they do or don't like them. Help the student add dynamics and phrase marks. Print these in their entirety and use them as a book. Print them on heavy paper or card stock and cut them into separate cards. Trying sending home a set with a student and ask them to become proficient with each one. At the next lesson, mix them up and play them in random order. It’s a nice combination of preparation and reading. I wish you every success using my Sightreading Flashcards! Note: I have intentionally omitted all time signatures, rests and fingerings. You may wish to add each beginning finger number. Each five-finger position has all up or all down stems. This is especially helpful for students with dyslexia and attentional issues. These same accommodations appear in my Attention Grabber books. Note: This is a 12 page downloadable PDF to print and reprint as often as you'd like. Each COPY CAT piece is made of catchy, physically comfortable phrases which are immediately imitated by the other hand. In some pieces, the right hand begins and the left hand imitates it. In others, the left hand starts. These pieces encourage an unusual and important combination of both sight- reading and using one’s ear. COPY CATS provide multiple opportunities to experience how playing the same notes in each hand doesn’t mean using the same finger numbers. They purposely do not include dynamics so the student can focus on interval reading and simple articulation. Note: the pieces in D Major, A Major and F Major are printed in two different versions — one with the key signature and one with no key signature. These side-by-side examples provide a refreshing opportunity to see exactly what a key signature does. The piece in G Major is printed with the left hand in two different positions - high and low. "I used these with a student last week -- amazing what it revealed about his reading, especially perception of intervals, and how they connect with his ear. These are truly useful tools for developing reading and coordination." I needed something unexpected. Funny. A little mischievous. A lot dramatic. I've always wanted to have some Attention Grabber Halloween pieces, and this is the suite of three pieces I wrote to fill that niche. I've taught it to almost all of my students in the past few weeks and every one of them loved it. I have no idea what will happen on the Halloween recital. It may come to blows. Will someone try to Jinx it? Will someone use Belladonna? Will it be a Calamity? Those, of course, are the titles of the three pieces in the Suite. Do you need something fresh and out-of-the-ordinary? Do you like my Attention Grabbers? Mean Little Monsters (Studio License) is available for instant download here. Enjoy! It's never too early to start being a good sight reader. Sight reading is all about getting rid of those little voices inside your head that say, "Is this actually an F? I'm probably wrong." It's all about getting an automatic keyboard response to the visual cue of the music. This is a short video I shot of my student, Natalie, working for the first time on my Sightreading Flashcards. This shows us working on the very first set—just reading landmark notes in quarter and half notes. It is simple, but challenging for a young student. Be sure to watch to the end where there's a little extra footage of a surprise at her lesson the week before. Enjoy! 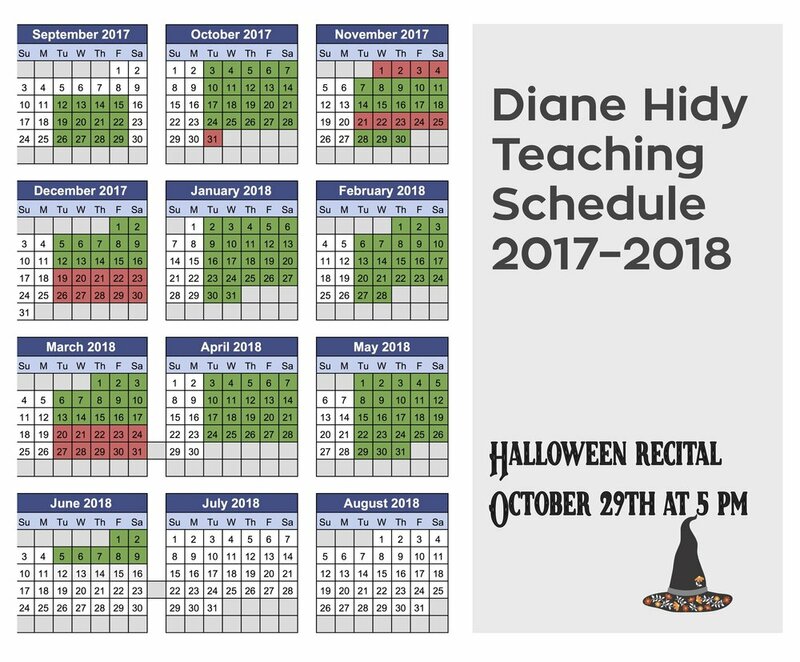 Get your copy of Diane Hidy's Sight Reading Flashcards here. Have you ever taught a kid who arrived to each lesson with an enormous, wet, wrinkly ring around the neck of his shirt because he'd chewed on it all day at school? Have you ever had a sweater that you loved but never wore because of that little scratchy place on the inside of the right sleeve? Do you always cut the tags out of clothing? These are sensory issues. Each person on the planet falls somewhere on the continuum of sensory processing abilities and sensitivities. You may have even said something like "I hate fingernails on a blackboard!" or "It drives me crazy to have hear someone chewing ice." "Water, no ice," my friend, Keith, orders in a restaurant. "I like my coffee HOT," my mother will say. We each have "our" coffee mug. You may think it's "your mug" because someone special gave it to you, but I'll bet that you also like it because of the feel of the handle, its size, shape and weight. Lace anklets like this drove me crazy as a child. It wasn't always that way. We weren't always the grown-ups. It was uncomfortable for some of us, for others it was agony. I lived somewhere in between. I still remember being seven years old. My mother splurged and bought me white lace anklet socks. They were wonderful. Until they slipped down under my heels into my saddle shoes. They drove me insane walking home from school that day and I never wore them again. Fifty years later I still vividly remember the sensation of walking up the front stairs of my house with the socks scrunched up under the arch of my foot. I was at a party last night chatting with my violin teacher friend, Elise. She asked me to help her learn some basics about Occupational Therapy. She said she has students with physical challenges and wondered if I could help her learn about ways to help them. This page is for her and perhaps for you, too. Occupational therapy sounds like something your mother thinks makes you do because you won't make it through college. "Sign up for that Occupational Therapy and maybe they'll come up with an Occupation you can do." It isn't. Occupational Therapy (OT) is an almost magical field that helps children learn better. A good Occupational Therapist can be a godsend to kids with issues. Even a basic working knowledge of OT is helpful for anyone working with children. It's especially useful for working with kids with sensory processing issues. The autism community has done us a great service by putting information in our hands that helps all children, neurotypical kids and less typical ones. The longer I teach, the less I believe there even is such a thing as a neurotypical kid. Each person needs a different mix of sensory input to feel comfortable. I find eating tiny wintergreen mints helps me stay alert when I'm teaching. My daughter will chew on the inside of her cheek (just like MY mother did - wonder if that's genetic?) unless she has gum to chew instead. My son was a shirt chewer until we found him a chewable toy that he could wear around his neck. Still a little unusual, but better than a wet shirt. Now someone's designed chewable jewelry. That's one I wish I'd thought of! If you get the mix of sensory input wrong when you're teaching, your student will persist until they get what they need. If they need to get up off the bench and move around, telling them to "Be good and really think!" will have no effect. Almost always, simply talking at a student will be ineffective. It's usually a mix of different kinds of stimulation that work the best. There's a sensory reason that using tiny Japanese Erasers works so well. It doesn't have as much to do with the fact that they're cute as the way they feel in your hands, their weight and texture. They feel calm and interesting. Small and heavy. In college and grad school, I spent more time learning about trill-endings than how to help a 7-year-old that won't stop kicking the front of the piano. In fact, I don't ever recall anyone ever addressing something as common as a squirmy kid. As piano teachers it's easy to concentrate on the music and forget that we're also teaching a set of physical skills. We are more like gym teachers and less like master class teachers a great deal of the time. Like it or not, we address these issues every day in our studios. Information is the key. Here are some books that can help. The "look inside" feature can give you the basic idea of many of these books without spending a penny. Buying one or two as a resource could be helpful, but even reading online and investigating for yourself will pay dividends. too loud, too bright, too fast, too tight is a great place to start if you'd like to understand how differently people experience the same stimuli. I'm convinced that as the world becomes more technical and more tech-connected, people with sensory issues will be challenged in ways we can now only imagine. There's a reason that it is recommended by Edward Hallowell, M.D., the author of Driven to Distraction, my favorite book about ADD - Attention Deficit Disorder. I like the tone and feel of The Sensory-Sensitive Child. It was written by two mothers who are child psychologists and also each have a child with sensory issues. 1001 Pediatric Treatment Activities: Creative Ideas for Therapy Sessions doesn't look as zippy as some of the other books, but is extremely useful. It's not easily available (or cheap) but Amazon has 50 pages of basic information in the "Look Inside" preview. It's free to peruse these pages which include a wide varieties of suggestions for activities that may help you focus and settle down a child with these issues. I got this email last month from the parent who was hoping I'd take his son as a transfer student. His son is twelve years old. I'd like to say that these emails are rare, but they're not. I get them all the time. It seems like teachers around the world are busy teaching students things that they're "supposed to" be teaching, while neglecting to teach their students pieces they'd love to play. Out of frustration with this sort of thinking, I made this video. I hope you enjoy it. I had a mother call me once and tell me that her child was "profoundly gifted." I was sure it was a bad sign. A parent who had bought into a label she thought would bring her child joy and fulfillment. In response to that call and interview that followed it, I made this little video. STOP!" said the voice inside my head. "You can't just cover up the notes. That's cheating. That's going to give her a bad message. You're preventing her from..."
"Hey, Amy," I said. "You aren't going to look at these notes anyway, are you?" "Nope," she said honestly. "I'm just going to look at the colored tape." "Cool," I said. "Let's make it WORK for you." It was finally over. That sense that I shouldn't be making it easier for her. That by keeping things a little too hard, a tad out-of-reach, almost a bit mysterious, I was doing her a favor. Amy has dyslexia - which means that her brain has difficulty recognizing and processing symbols. It's unlikely she will ever enjoy reading complex scores for pleasure. She loves to play and does it quite well, but part of my job is helping her interpret the written page. She comes to me to learn pieces that she couldn't play without me. For reasons that elude me, I felt like I shouldn't REALLY help her. Like I should hold something back. I had some imaginary standard that prevented me from turning the written score into something she could actually use. Learning differences are something else entirely. When a student has a challenge, it's my job to help them meet it with every bit of skill I have. If I need to white-out bar lines or write in note names and color code the score, then I'm going to be proud of my efforts. And proud of theirs as well. I realize I had mistakenly believed I could teach the learning difference right out of her. I knew better. Brains aren't like that. They can be challenged. They can grow and change. But to think that I shouldn't help her in the ways that she specifically needed help was ridiculous. And just plain mean. This belief is something I picked up in the land of "serious music education" where I spent so many years. Somewhere between Counterpoint class and Chromatic Analysis in the Music of Wagner. I desperately wish there had been a class somewhere in my education called Teaching Children with Learning Differences. It would have been a lot more practical than all that stuff about Opera Seria and Opera Buffa. (If you don't know, count your blessings.) Instead, I've had to educate myself. After all my independent education, Amy and I are a good combination. And I intend to keep it that way. It may take a little work to keep that imaginary standard at bay.